Party services are also provided from our expertised event planning team. From its early beginning till and the conceptual idea till the very end of the realisation our people work with commitment to provide the highest caliber of services. The carefully made party concepts are being prepares with great attention to the detail and according to your request. Our party services cover all the aspects of a social event and we are dedicated to help you design that unique event of your dreams, while keeping your vision and ideas in mind. We utilize our expertise in all areas of event planning to ensure that your event is all that you desire and more. We have an eye for detail and an ear for your every wish. With us by your side you and your guests can simply relax and have fun. 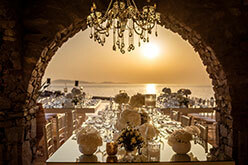 In our portfolio you can find parties organized in islands especially in Mykonos with unique aesthetic and concepts! Consultations: Meetings with client, vendors and venues.